Change the style of your home and improve its energy efficiency by updating your old windows with new, vinyl Feldco windows. With over 40 years of experience and 350,000 delighted customers, we are the go to company for Central Illinois homeowners looking to replace their windows. With a variety of style and color options available, there is no reason to compromise beauty for energy efficiency. Get your project started with Feldco today and get windows you’ll enjoy year round. Why Is Feldco The Best Window Replacement Company in Peoria? Since 1976, Feldco has been recognized nationally and locally as one of the top window companies in the nation. With hundreds of thousands of satisfied customers, our focus is to delight them by bringing them the best the industry has to offer in regards to products, installation and service. We have transformed homes all across the Midwest for over 40 years and will continue to do so for years to come. With a wide variety of window styles available, we aim to make your window replacement project easy. Keep the current window style you have or completely change your home with a new design. Feldco offers many colors and design options to help you complete your home’s transformation. 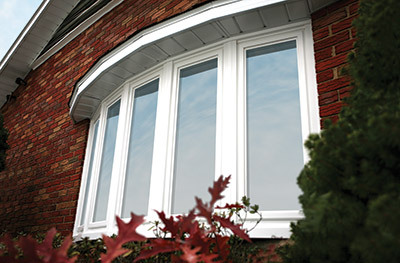 All of our windows are energy-efficient and durable so you can’t go wrong choosing any of the styles available. 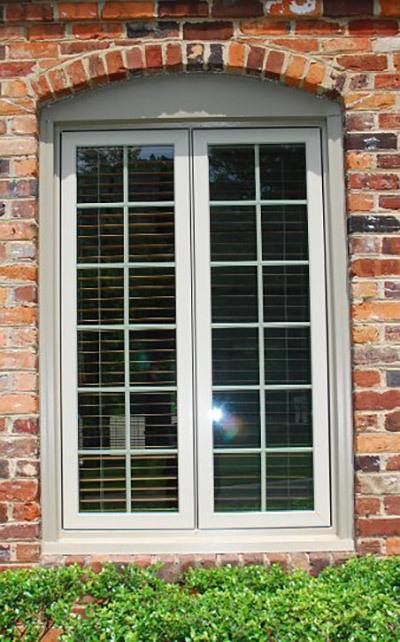 Double hung windows are the most common style of window. Homeowners enjoy the two operating sashes which tilt into the home for easy cleaning. Since double hung windows provide a clean and classic look, they’re the perfect windows to enhance any room of your home. With a large sash that’s operated by a hand crank, casement windows are a great choice for homeowners looking for an unobstructed view. Its design allows you to crank the window open a little or all the way, giving you the control of how much air flow enters your home. Sliding windows, or sliders, can be constructed as 2-sectioned or 3-sectioned panes depending on the size of your window opening. 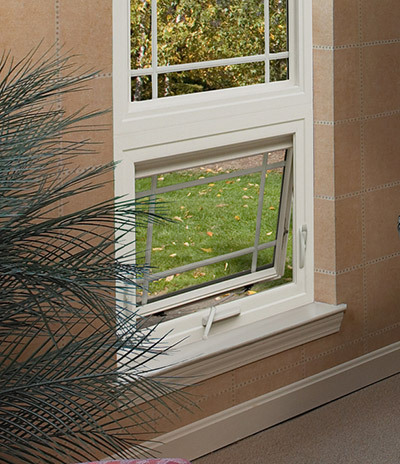 Much like the double hung window, the sashes of the slider can be cleaned easily. 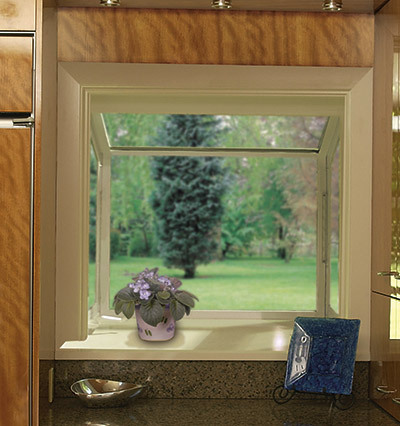 Since they are easily operated, sliding windows are a great addition to kitchens and bedrooms. Both bay and bow windows extend past your home’s exterior. 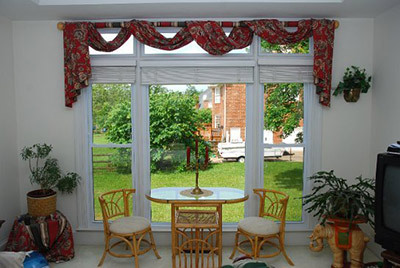 A bay window consists of one large picture window flanked by a window of your choice on either side. A bow window is similar, but consists of three to five equal sized windows to create the overall window opening. 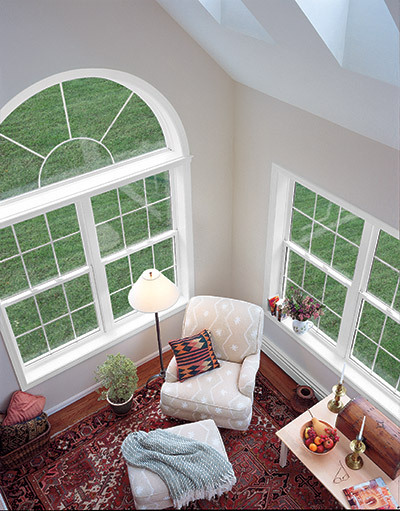 Since bay and bow windows add a lot of beauty to a home, they are typically best suited for a room with a great view. Picture windows are inoperable so, while they don’t ventilate, they offer great unobstructed views. Typically found in living rooms and family rooms, picture windows are perfect to make a room seem larger by allowing a lot of natural light in to the home. Combine a picture window with any operating window styles to create the perfect window look. Awning windows are hinged at the top and open outward from the bottom creating an awning affect. Typically best suited for a smaller window opening, they make a great addition to kitchens, bathrooms and basements. 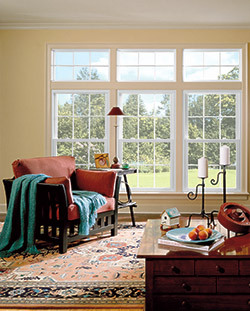 Basement windows are also known as hopper windows. Hopper windows come with an easy to operate handle so you can pull the window sash in for cleaning and to allow air flow into your home. Similar to bay and bow windows, a garden window extends past your home’s exterior. The garden window has two fixed sides and a center pane that vents. Garden windows are typically found in kitchens, right above the sink, because of its easy access. 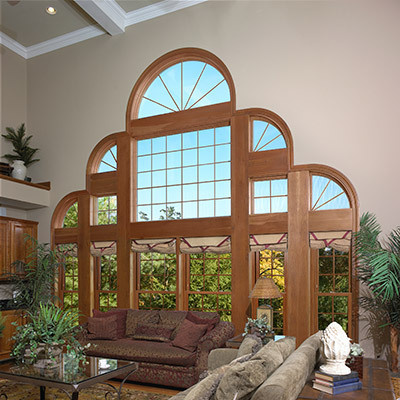 Add a unique touch to any room by adding an architectural or shaped window. They come in different shapes and sizes and are often combined with other windows to accent bedrooms, dens, entryways or hallways. The team of installers sent to complete your project is among the best in the industry. They are dedicated to treating your home with care and properly installing your windows so they can provide the most energy efficiency for your home. The installers are all factory trained, drug tested and background checked to make sure you are receiving nothing but the best experience with your window installation. With over 40 years of providing the best replacement windows in Peoria and Central Illinois, you can be comfortable in your decision to choose Feldco for your project. From your initial estimate to your professional installation, we aim to make your window replacement project stress-free. Get started with Feldco today and join 350,000 delighted customers.